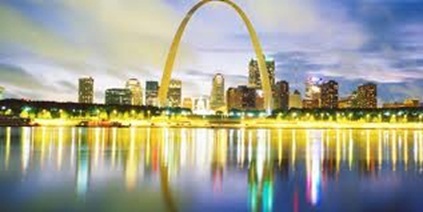 A state greatly impacted by progressivism in the 1920’s, Missouri has allowed itself to be rapidly propelled into the 20th century despite great changes to its economy and internal industries. The state has the distinct title of claiming St. Charles, MO as the first city with an interstate highway project. No matter semantics of “first” city, the early adoption of such a program allowed both residents of the state to easily move around as did it provide an enormous boon to the formative years of the trucking industry. Today, Missouri is perhaps best known for exporting aerospace-related materials as well as equipment for the transportation industry. The State’s DOT has successfully reduced traffic accidents and deaths every year since 2006. Modern city landscapes amidst the natural mid-west terrain, Missouri is also a combined economy of industry and farming, and a great place for truck drivers as well. Transporting everything from transportation equipment to food products to chemicals and machinery, trucks are essential to over 81 percent of Missouri's goods within and out of the state. As of 2011, a reported 10,320 trucking companies were operating in Missouri and paying out over $6 billion in annual wages. The U.S Bureau of Labor Statistics reported that in 2010, the trucking industry provided a total of 143,020 jobs or one out of fifteen jobs in Missouri and drivers still continue to be in demand. Earning an average annual income of $41,846, Missouri truck drivers can make well above the national average and many companies offer a whole list of other benefits as well. With its sprawling flat landscape and state's commitment to road safety, Missouri is definitely a truck-friendly state beyond the moneymaking opportunities for truck drivers. The Missouri Truck Association is a strong affiliation of professionals also committed to the state's truck drivers through improved driver training, investments in advanced safety technology and community safety initiatives. These state-oriented safety programs have drastically reduced the number of large truck fatalities to the lowest number ever, on a national level. While there are plenty of truck driver jobs available in Missouri, the cities with the most jobs are Kansas City, St. Louis, and Springfield. It is up to you to decide if you want to live in one area in particular or willing to live anywhere in the state and open yourself up to more job options. There are also a wide variety of truck driving positions in this state as well and you must also decide what you are seeking or what is best suited to you in particular. For example if you have a young family and its most important that you are able to get home every night, then you should limit your focus to the local type of delivery jobs. Those willing to spend weeks on the road a time will have more options with the current demand for long haul drivers and more earning potential as well. Another way to increase your options and earning potential is to consider your experience and certification. Experienced drivers are harder to come by and therefore employers are willing to pay them more in whatever capacity of truck driving. You can also make a big difference in your hiring and earning potential with the classes of commercial drivers license you carry and the endorsement levels you qualify. Once you determine the specific criteria to focus your job search, you will be that much more effective in generating the right results. All you need is your wish list of ideal jobs and TruckDrivingJobs.com to match your criteria with all the hiring employers across the state of Missouri. Not only that, our on-line application process links you immediately to all your prospective employers, helping you beat the competition and getting your truck driving career started at once. Below are list of companies currently hiring within missouri. Call 816-781-3408Based out of Kearney, B & B Trucking owns 317 trucks and transports all kinds of freight. Call 417-232-4348Based out of Lockwood, Oak Ridge Shavings owns 401 trucks and primarily transports Wood. Call 573-887-3100Based out of Chaffee, S & W Cabinets owns 990 trucks and primarily transports Building Materials, Construction equipment. Call 636-949-5507Based out of St Peters, B & J Insulation owns 142 trucks and primarily transports regular Flatbed & Reefer loads, Building Materials, Machinery, Oversized loads such as Farm Mining or Oilfield equipment, Insulation Equipment. Call 660-777-3486Based out of Clifton Hill, K & A Trucking owns 369 trucks and primarily transports building materials Dirt & Sand. Call 636-931-8369Based out of Herculaneum, H & H Hauling owns 179 trucks and primarily transports Machinery, Oversized loads such as Farm Mining or Oilfield equipment. Call 636-566-6250Based out of Winfield, G T Wagner Transportation owns 710 trucks and transports all kinds of freight. Call 636-338-4788Based out of Hawk Point, B & H owns 494 trucks and primarily transports Machinery, Oversized loads such as Farm Mining or Oilfield equipment, Construction equipment. Call 314-965-7783Based out of Kirkwood, Logistics owns 136 trucks and primarily transports regular Flatbed & Reefer loads, Dry Van, Paper Products. Call 573-642-0813Based out of Kingdom City, G A Propane owns 125 trucks and primarily transports Petroleum Gas & Natural Gas, Toxic Materials. Call 573-883-5008Based out of Ste Genevieve, M & M Kertz Farms owns 875 trucks and primarily transports Grain, Feed, Hay. Call 660-935-2224Based out of Maitland, H Theodore Trimmer owns 372 trucks and primarily transports Livestock, Grain, Feed, Hay. Call 573-484-3576Based out of Leslie, A & J Hauling owns 196 trucks and primarily transports regular Flatbed & Reefer loads, Logs, Poles, Beams, Lumber, Building Materials. Call 816-858-2611Based out of Platt City, K & P Trucking owns 797 trucks and primarily transports regular Flatbed & Reefer loads, electrical supplies , Toxic Materials. Call 660-259-3463Based out of Lexington, E Glenn Shank & Michael Shank owns 905 trucks and primarily transports regular Flatbed & Reefer loads, Building Materials, CASINGS. Call 417-642-5842Based out of Asbury, C & R Disposal owns 876 trucks and primarily transports Garbage, Refuse, Trash. Call 660-686-2611Based out of Fairfax, Fairfax Elevator Co owns 496 trucks and primarily transports Grain, Feed, Hay, Dry Van. Call 636-240-4306Based out of Ofallon, R & R Contracting Services owns 905 trucks and primarily transports regular Flatbed & Reefer loads, various metals such as Brass, Titanium, Copper, Iron, Logs, Poles, Beams, Lumber, Building Materials, Paper Products, Construction equipment. Call 660-747-8289Based out of Warrensburg, H Neal Devasher owns 860 trucks and primarily transports regular Flatbed & Reefer loads, various metals such as Brass, Titanium, Copper, Iron, Logs, Poles, Beams, Lumber, Building Materials, Machinery, Oversized loads such as Farm Mining or Oilfield equipment, Intermodal Containers, Livestock, Grain, Feed, Hay, Coal, Coke, Dry Van, Farm Supplies, Construction equipment. Call 660-882-3307Based out of Boonveville, Nash's Towing owns 997 trucks and primarily transports Car hauling. Call 573-486-3322Based out of Hermann, G & D Engemann owns 623 trucks and primarily transports Machinery, Oversized loads such as Farm Mining or Oilfield equipment, Grain, Feed, Hay, Coal, Coke, Dry Van, building materials Sand. Call 573-692-0441Based out of Gravois Mills, R & K Mobile Home Transport owns 604 trucks and primarily transports Mobile Homes. Call 417-725-3365Based out of Nixa, C A B Communications owns 155 trucks and primarily transports Construction equipment. Call 573-288-5573Based out of Canton, Larrys Tool Sales owns 548 trucks and primarily transports testing equipment. Call 816-847-7585Based out of Grain Valley, D & B Delivery owns 551 trucks and transports all kinds of freight. Call 573-682-5728Based out of Centralia, C & B Mobile Home Transporting owns 524 trucks and primarily transports Mobile Homes. Call 660-341-4370Based out of Gorin, Zeiset Bros owns 694 trucks and primarily transports regular Flatbed & Reefer loads, Grain, Feed, Hay, Dry Van, Construction equipment, building materials. Call 417-796-2454Based out of Forsyth, G Mark Gideon owns 523 trucks and primarily transports Construction equipment, TOP SOIL. Call 573-437-2775Based out of Owensville, B & B Concrete Company owns 288 trucks and primarily transports Construction equipment, CONCRETE. Call 417-736-2626Based out of Strafford, G L Jeffries Trucking Co owns 669 trucks and primarily transports regular Flatbed & Reefer loads, various metals such as Brass, Titanium, Copper, Iron, Logs, Poles, Beams, Lumber, Building Materials, Machinery, Oversized loads such as Farm Mining or Oilfield equipment, Grain, Feed, Hay, Construction equipment. Call 816-330-4040Based out of Platte City, H & H Septic Service owns 897 trucks and primarily transports Construction equipment, Pumping & Draining services. Call 660-499-2418Based out of Creighton, A & M Quarries owns 659 trucks and primarily transports Construction equipment, raw materials , Toxic Materials. Call 573-696-3381Based out of Hallsville, E Gerald Sims owns 251 trucks and primarily transports Construction equipment, building materials Sand Dirt MULCH. Call 573-276-2306Based out of Malden, F D Trover owns 758 trucks and primarily transports Grain, Feed, Hay. Call 816-930-2171Based out of Plattsburg, United Cooperatives owns 89,144 trucks and primarily transports Petroleum Gas & Natural Gas, Grain, Feed, Hay, Chemicals, Dry Van, Farm Supplies, Toxic Materials. Call 314-569-2664Based out of University City, L E G Brown Hauling owns 946 trucks and primarily transports Petroleum Gas & Natural Gas, Dry Van, Construction equipment, Toxic Materials. Call 660-827-1385Based out of Sedalia, B & P Excavating L L C owns 332 trucks and primarily transports Machinery, Oversized loads such as Farm Mining or Oilfield equipment, Dry Van, Construction equipment. Call 660-884-4800Based out of Pilot Grove, B & L Mobile Home Service owns 278 trucks and primarily transports Mobile Homes. Call 573-654-2487Based out of Arbyrd, Younely Padgett owns 985 trucks and transports all kinds of freight. Call 573-237-4576Based out of New Haven, T M S Enterprises owns 648 trucks and primarily transports Dry Van. Call 573-438-4920Based out of Old Mines, N I W owns 145 trucks and transports all kinds of freight. Call 417-667-2777Based out of Richards, R & B Ranch owns 803 trucks and primarily transports Grain, Feed, Hay, Dry Van. Call 573-636-7890Based out of Jefferson City, A 1 Cardwell Moving & Storage owns 415 trucks and primarily transports Household Goods. Call 660-582-7740Based out of Conception Junction, G & R Meyer Farms owns 957 trucks and primarily transports Grain, Feed, Hay, Farm Supplies. Call 660-327-1314Based out of Paris, G & L Farms owns 753 trucks and primarily transports Petroleum Gas & Natural Gas, Grain, Feed, Hay, Farm Supplies. Call 660-535-4407Based out of Union Star, E Clayton Tunnell owns 603 trucks and primarily transports Livestock, Grain, Feed, Hay. Call 573-265-8950Based out of St James, H & H Automotive owns 868 trucks and primarily transports Car hauling. Call 417-394-2923Based out of Jasper, M D Kollmeyer owns 956 trucks and primarily transports Building Materials, Machinery, Oversized loads such as Farm Mining or Oilfield equipment, building materials , Toxic Materials.